GreenScape Horticultural Service is a new type of Horticultural service company. Developed from decades of designing and maintaining interior plantscaping accounts, our communication and service techniques will satisfy even the most discerning building managers. We proudly introduce our equally exceptional exterior landscaping management services. Employing professional graduate horticulturists and licensed, trained service technicians, GreenScape services are focused on you, your satisfaction and your image. We provide creative and cost-effective solutions to any landscape challenge, executing every task on schedule with a minimum of disruption to your clients or your property. Mowing, edging, trimming, blowing, mulching, fertilization, pest and insect control, seasonal and perennial flower programs, pruning, irrigation aeration, seeding and weed control. 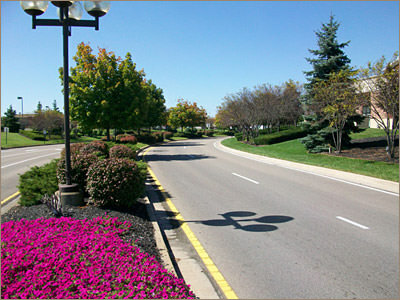 Landscape design, installation or shrub and tree replacement are all part of the complete service. Snow removal and parking lot sweeping services are also available. We are the experts in choosing tropical and landscape decorative plants to provide the most unique patio or entranceway designs. Whether you are looking to enhance the landscape at your home or business, GreeenScape can help you realize the potential of your property. GreenScape Horticultural Services provides outstanding design services including Computer Design and Imaging. Allow our design and installation experts to create a beautiful landscape for your business or property. Feel free to contact our office for a free consultation and quote.